Palestinian composer and musician Simon Shaheen not only played with his ensemble but gathered together guests to dance (Cassandra Shore) and to play the piano (Chris Morano). 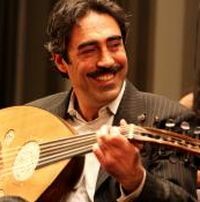 His ensemble which included Bassam Saba (nay and flute) Najib Shaheen (oud), Ali Amr (qanun) Tareq Rantisi (percussion) Walid Zairi (upright bass) also had singers Mayssa Karaa and Naji Youssef. It was an entertaining evening, but a bit too long. The concert lasted almost three hours. It started late, and the musicians, especially Shaheen, took a lot of time tuning instruments. 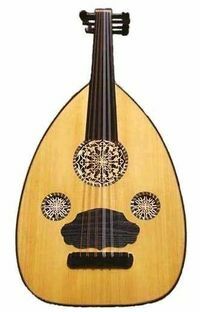 Shaheen at one point apologized saying that if he didn't tune his oud, then the music wouldn't come out of tune. I noticed some empty seats after intermission, and I suppose it was because the first half ended at 9.30, almost the amount of time for a normal concert. It's a pity also that there weren't any surtitles when the vocalists sang. I noticed some non-Arabic-speaking members of the audience looking puzzled. There were a few notes, however, in the programme that explained and translated portions of the songs sung. I also would like to suggest that a brief bio of the other artists be put in the programme. The only bio there was that of Shaheen, a two-page long cv of his achievements. True, the focus was really on him, but credit should also be given to the others. This was the last production of the 2012-13 season of the Chan Centre and Managing Director Joyce Hinton spoke briefly at the start to thank subscribers, sponsors and patrons. This concert was produced as part of the MOA exhibit SAFAR/VOYAGE which is now on display until September 15th.